The KADME (Knowledge And Data Management Expertise) team is composed of people that have many years of experience improving access to data within the Oil and Gas industry. Part of the team has been involved with DISKOS since its inception in 1993. The tagline “Scalable Data access in the Oil and Gas domain” perfectly represents the driver behind our Whereoil technology, which is an Insight Engine for E&P data sources designed for Big Data and analytics. Whereoil connects to several information sources, both structured and unstructured, and offers a robust API for machine learning and E&P workflow integration. To unlock the full potential of their data, companies need to digitally transform their business and get ready to take advantage of new technologies such as machine learning, cloud computing and artificial intelligence. Whereoil gives them a rapid path to achieve their digitalization efforts, with effective methods to search, access and connect this data making it available for interpretation and analysis by both humans and machines. 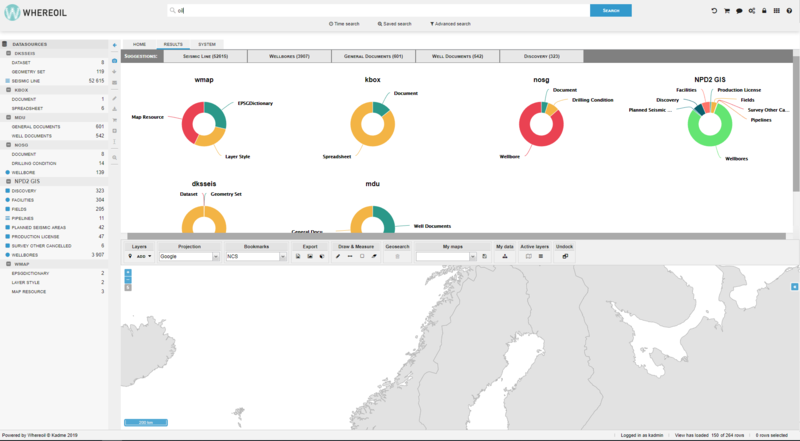 Maybe the most relevant and visible example of how KADME is helping the oil industry to modernize management of E&P data is the DISKOS data repository in Norway, which is built on a Whereoil-based solution operated in collaboration by CGG, KADME and EVRY.